Other the years, ‘therapy animals’ have been trained to comfort and heal hospital patients, cancer victims, returning war veterans (many with PTSD symptoms) and the elderly. For those unfamiliar, animal-assisted therapy (AAT) is a type of therapy that involves animals as a form of treatment. Animals that qualify for these important roles include domesticated pets, farm animal and even marine animals, such as dolphins. And while their work is invaluable in aiding and in many cases actually curing the afflicted, they and their trainers, in my humble opinion have not received the type of acclaim nationally that is their due. Well, that was until now. 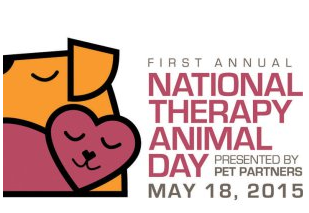 Non-profit Pet Partners, the national leader in promoting human-animal therapy has officially proclaimed Monday, May 18th, the First Annual National Therapy Animal Day™. The special day was created to recognize all of the exceptional therapy animals who partner with their human companions to bring comfort and healing to those in need. In honor of the day, the date is also being distinguished as “Treats & Sweets Day,” where Pet Partners is asking thousands of bakers to whip up some special edibles for these very special animals. Those that participate will help support PP in training and registering thousands of therapy animal teams who make over a million life-enhancing visits each year. The fund-raiser has raised $14,905.45 so far for this initiative (as of this posting). “Humans and animals have always shared a strong bond,” says Grenda Pearlman, director of volunteer services at Providence Saint John's Health Center in Santa Monica, CA. “Throughout history our pets have given us companionship. It’s only natural that this gift is now being used to help those who are sick and at their most vulnerable. This event is just one way to celebrate the amazing work of our volunteers and bring awareness to animal-assisted therapy,” notes Pearlman. Strategic design and marketing firm, TFI Envision, Inc. will be celebrating their very own Therapy Animal. Elizabeth Bell and her dog Honey, an 8yr-old Havanese have served on a therapy animal team since the pooch was a pup. Their involvement comes as part of the Healing Hounds Program at Stamford Hospital in Connecticut. Hope you will be celebrating the first National Therapy Animal Day with your favorite therapy animal team . . . and, if you have a special therapy animal story you’d like to share, please do so in the comments below. Panda Boom? Conservation Efforts Working?